WE’RE BACK in Ole Bengalure, in the Defence Colony in Indiranagar, a very pleasant tree lined place, with lovely birds singing and butterflies dancing like flowers in the breeze. We note that the developers are beginning to knock down perfectly serviceable houses, no doubt to replace them with offices, and we fear for the future of Bangalore if this trend continues. 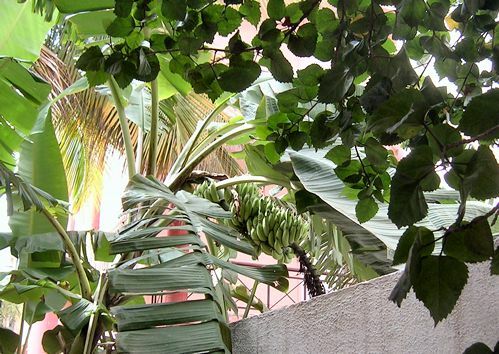 This entry was posted in Uncategorized and tagged banana, Bangalore, Bengaluru, papaya. Bookmark the permalink. Surely banana*plant*. 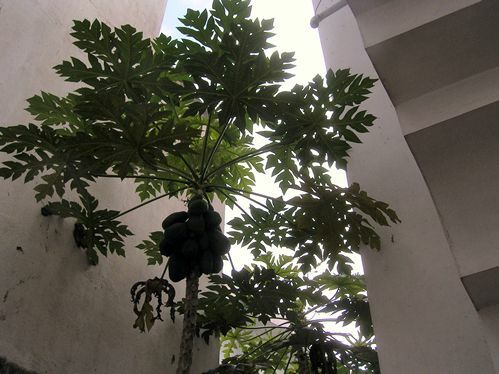 The plant does not have a true trunk so it is not actually a tree. Interestingly, there is a variety of Muso that will—in theory, when the root mass is heavily mulched—survive a USDA Zone 6 winter here in Southern New England. I have not yet experimented. Indeed I have even spotted some variety of bamboo growing in dense little thickets here and there and which seems to have little trouble making it through the winter with no special care at all. There is a small, steep hillside outside my window here that is a fugly entanglement of thorny wild rose vines, opportunistic Chinese bittersweet vine, wild sumac, along with a cacophony of other noxious plants. It is begging for an even more opportunistic introduction of bamboo to shield my privacy from the road above. Bamboo is so aggressive that it should starve out the others. Look at this in a practical way: If you get the bananas before the little primates, you wouldn’t have to go out to fetch them from the streets. And why haven’t you photo’d the streets of Bangalore? I would like to see how the markets look like, pubs and wine bars in Ole Bengalure. Am I the only one interested in that? There’s a lot of stuff about Bangalore on here, including videos – Bangalore is high up in the cloud. Bannana is relaitively Hard Fruit, as Hard as Apple & similar in Texture. What most people think of as bannana, is after fruit has broken down thru chemical action, makeing it soft. Showing that Some Monkeys live outdoors & some indoors. Monkeys have tails & I froze mine off, yet bamboo can survive in freezing climate, around Washington there are few, very few small bamboo growths, in deep warmer hollow areas. Next it will be Coconuts, I bet. Signed:PHYSICIAN THOMAS STEWART VON DRASHEK M.D,.